PORT ST. LUCIE, Fla. — By now, Tim Tebow has shown he belongs in professional baseball. He's fully committed to the game and much more comfortable on the field. "I didn't run or I didn't play one snap of outfield," Tebow said Saturday, eliciting big laughs while catching his own slip-up. Nevertheless, the 2007 Heisman Trophy winner is no fish out of shoulder pads anymore. He's not on the 40-man major league roster, but he's in big league camp for the second consecutive year and ticketed for Triple-A Syracuse in April. 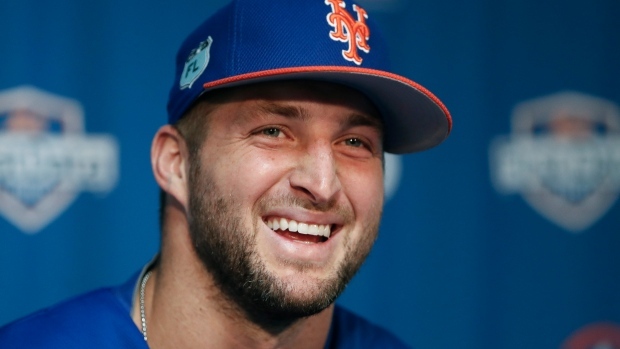 "This will be like, sort of the biggest spring training for me," the 31-year-old Tebow said. "This journey isn't defined by just getting there. I think, shoot, I've already enjoyed it enough to say it's worth it. The whole process. Would that be awesome? Of course it would. It would be such an amazing thing and it would be so enjoyable, but at the same time, regardless of what happens, I know that I'll enjoy it every day and I think that's the biggest thing for me." "He did a tremendous job last year," Mets manager Mickey Callaway said. "You have to give him credit for the strides he made." "Means he's pretty awesome," said a smiling Tebow, who won two national football championships in college. Tebow's thick arms and muscular frame helped him launch several balls over the fence on a back field. He's been working with personal hitting coach Jay Gibbons, an ex-major leaguer who travelled with Tebow throughout the off-season while he worked his other job as a college football television analyst. "It's hard contact. I think I need to have a talk with him about his conditioning. He's probably not strong enough," Callaway cracked. "So yeah, it's raw power, it's real, and the bat moves through the zone pretty swiftly." "This kid has confidence, because he works. And I definitely see a baseball player out of Tim Tebow. Not just because he's in a uniform, but because he wants it so bad," the manager added. At the souvenir stand between Tom Seaver Curve and Willie Mays Drive, No. 15 Tebow T-shirts were on sale for $32 along with those of several other players. Tebow's shirt was grey, while the big leaguers were in blue. "We're just going to get him out there as much as possible," Callaway said. "We want to get him out there and see major league pitching. And I know he's going to continue to improve because that's who he is." "It's kind of hard to put into words how much more comfortable I feel, to be honest with you. Just in the little things. Shoot, in knowing what I'm going to grab to bring out there with me for practice, you know?" Tebow said. "Just playing catch, going through the motions, balls off the bat, off the wall, all of those things." "I love the grind of it. I love the challenge," he said. "Even like for football with training camp, I loved it. I think I was kind of weird that way, but I embraced it. I kind of think I'm the same way with baseball." So even with revered ex-Florida coach Steve Spurrier pitching him a spot in the new Alliance of American Football, Tebow wasn't interested. "It wasn't very hard — and they've called a lot. And Coach Spurrier keeps calling — and I love Coach Spurrier," Tebow said. "I'm all in on baseball. No way could I stop and not give this the chance after everything that I've worked for."